The "Sandbox" is a lovely 3 bedroom cottage only 187 steps away from beautiful Popham Beach which offers tidal pools, islands, lighthouses, over three miles of sandy beach, and two old stone forts for you to explore. The cottage comfortably accommodates six guests with sleeping arrangements consisting of two traditional bedrooms (a queen bed in one and two twins in the other) and a full sized bed located in our stunning wrap around sunroom. The "Sandbox" is nestled in the historic quaint community of Popham Village. You will enjoy strolling, fishing, swimming, hiking and collecting sea shells along the beach. If hungry you can walk only 5 minutes down to Spinney's resturant to enjoy an oceanside breakfast, lunch, dinner OR ice cream. 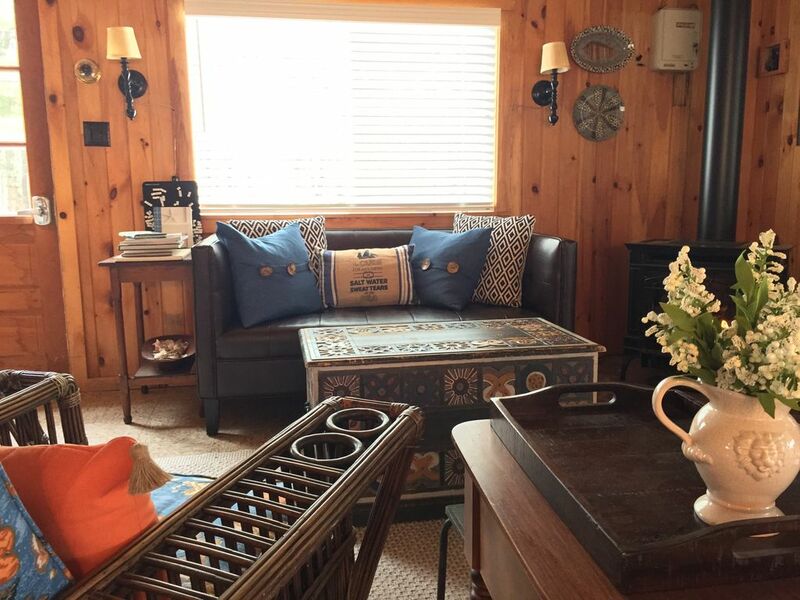 The cottage has internet, games, puzzles, a propane grill, a DVD library and a gas fireplace for those foggy coastal nights when you just want to stay in and relax. The large sunroom is designed to be both a community room where friends and family can relax listening to the sound of the ocean surf that surrounds the cottage in addition to being an incredible bedroom. I am a Maniac. Born in Portland, and summered in Bar Harbor where both my Parents were born. (OK, I went to school and in Connecticut and currently live in Vermont) But, Maine is where I call home. I love the smell of the salt air, the endless adventures to the small seaside villages and the abundance of festivals, craft fairs and outdoor activities. Popham Beach is such a magical place on the Midcoast of Maine. The beach has soft clean sand with PLENTY of room to spread out your blanket and have a quiet day at the beach. The history of Popham is fascinating from colonial settlements to ship building. And, the proximity to Freeport, Portland, Boothbay makes day tripping a breeze! This property is tucked away in a Pine grove just steps from the beach. It is wonderful to have the amenity of strolling, swimming and fishing however, getting away at the end of the day and sitting on the screen porch listening to surf at a private cottage is the best of both worlds. Only 187 steps away from Poham Beach. "The Sandbox" is located in Historic Popham Village. Research into the fun facts and features of the area is encouraged. Beautiful, clean, lovely linens, large flat grassy yard, so many windows and bright cheery inside. We had 6 adults and 1 baby and were very comfortable. Thank you for the review. We always are hoping our guest enjoy their stay as much as we enjoy our Sandbox! Great Place To Get Your Toes Wet! We had a fantastic time staying at this quaint Cottage just steps away from beautiful Popham Beach. This area is close to Portland, Maine, LL Bean, an amazing ship museum in Bath and near many great restaurants. Bath, Maine is a sweet little town known for it's shipbuilding. Popham's history is also fascinating. The beach house is equipped with a sound working kitchen and grill. The twin beds and queen size beds are comfy. The porch was a treat! Lynn, hostess of Sandbox, made sure we arrived and she answered texts quickly. We also liked having access to the TV and internet. We really enjoyed Lynn's lovely beach cottage. We would definitely return to this sweet spot on Popham Beach. The property was clean and had everything we needed for our stay. I loved the screened in room though it was a bit cold at night this time of year, Late June. The walk to the beach was easy. At night we could play games or watch a movie. It did comfortably fit the 6 of us. Thanks. We spent three nights there with two kids and it was perfect for relaxing and exploring. The owners were extremely helpful and responsive. When the hot water went out they fixed it immediately. We’re so thankful that they were willing to share this gem with us. Fabulous location, very well appointed Cottage. We had a wonderful time at this cottage. The location could not have been better. The large screened-in porch was a fantastic place to relax and read. We had wonderful long walks on beautiful Popham beach daily. What a perfect place to get away from it all.